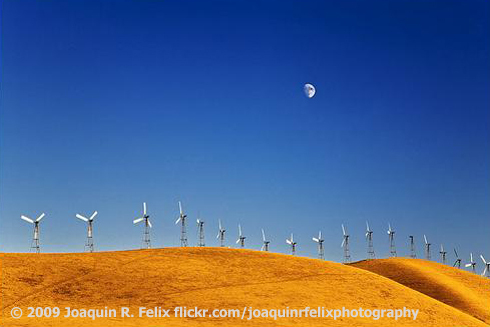 What effect does wind power have on birds? Scientists are taking a close look. Surveys of wind-power projects in Oregon and Washington estimate that wind turbines kill more than 6,500 birds annually. Of particular concern are raptors such as owls, hawks, and eagles. Is replacing oil with wind power an acceptable trade-off? One answer is clear: energy conservation lessens our dependence on both. Because we’re thinking more now about the impact of energy development on the environment, let’s ask: what effect does wind power have on birds? Scientists in the Pacific Northwest are taking a close look. Surveys of wind-power projects in Oregon and Washington estimate that wind turbines kill more than 6,500 birds annually.1 Of particular concern are raptors such as owls, hawks, and eagles, whose fierce pursuit of prey may make them oblivious to lethal danger spinning nearby. By way of comparison, however, house cats and collisions at night with skyscrapers and lighted telephone towers kill millions of birds nationally every year. Because human actions can have enormous consequences for nature, we’re faced with inevitable dilemmas, such as the question: Is replacing oil with wind power an acceptable trade-off? One answer, however, is clear: energy conservation lessens our dependence on both. Call of the Red-tailed Hawk provided by The Macaulay Library at the Cornell Lab of Ornithology, Ithaca, New York, recorded by L.J. Peyton. 1/ Hal Bernton, “Scientists study wind-farm risks to birds” The Seattle Times, June 6, 2010.